Hold off on the champagne, though, because you're not done working yet. Leads aren't actually your goal ... marketing qualified leads are. And just because a lead downloaded downloaded something doesn't mean they're ready to make a purchase decision. Lead nurturing is the process of helping a lead become more educated about the challenge they're trying to solve and also more educated about the value your company provides. It's your job to guide that lead through each stage of the buying journey, to the point where the lead becomes a marketing qualified lead and is ready for a bonafide sales conversation. Implementing an effective nurture strategy can have a huge impact on your results from inbound marketing. The key is to use the tools available to you – like marketing automation – to streamline the process and to ensure you’re strategically setting up your lead nurturing workflows. To guide your leads to the next stage of the buying journey, first you must understand what your funnel looks like. Top of Funnel (TOFU): This is your high-level content, created for leads who are just beginning to understand exactly what their pain point is. Middle of Funnel (MOFU): This content is a bit more hands-on, created for leads who want to explore specific options for solving their challenges. Bottom of Funnel (BOFU): This is content that positions your specific solution as the lead’s best option, such as buying guides and case studies. 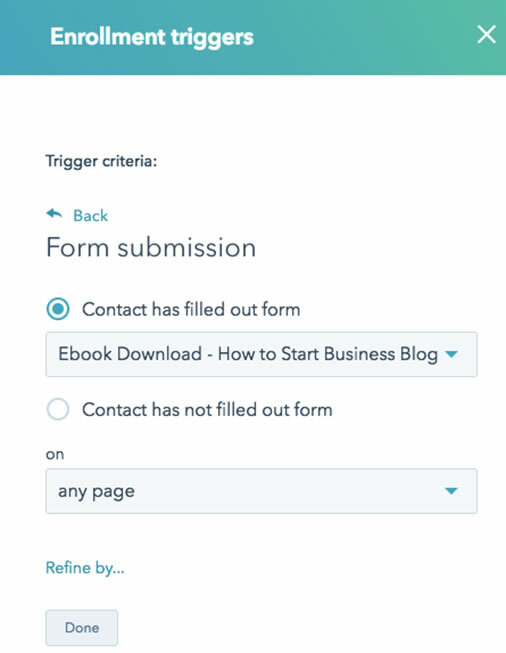 We want to create a HubSpot workflow that triggers when a lead downloads one of these content offers and sends a follow-up email with content from the next stage of the funnel. That’s why categorizing your content is so important. If a lead downloads a middle-of-funnel content offer, you wouldn’t want to send that lead a top-of-funnel offer next. That would move the lead backward! Instead, you’d want to send them a bottom-of-funnel offer that encourages the lead to move closer to buying from you. Once you know how your content maps to this buying journey, you’re almost ready to start building your workflows. Before you can build anything, you need to specify the desired outcome. Your ultimate goal for the lead nurture workflow is for the lead to take a significant buying step. This might be to request a consultation, visit a pricing page or engage directly with a sales rep (in which, the rep might update the lead's status to "Opportunity"). The key is to make sure that this goal can be quantified in HubSpot. As soon as a lead meets the goal criteria, the lead will be withdrawn from the workflow. This ensures the lead doesn’t continue to receive automated marketing emails from you at the same time that a sales rep is actively engaging with the lead, which would be awkward! To make sure our lead nurture strategy is covering the entire funnel, we're going to create three distinct workflows: one for leads who download top-of-funnel offers, one for leads who download middle-of-funnel offers, and one for leads who download bottom-of-funnel offers. Let's start with the top-of-funnel offers, or TOFU offers. When someone downloads a TOFU offer, this workflow will wait a few days and send the lead a follow-up email that contains a link to a related middle-of-funnel (MOFU) offer. One important question to think through is whether you want to enroll contacts who already meet these criteria. For example, if you’ve had your offer available on your website for a while and you haven’t been nurturing leads who’ve downloaded this offer, enrolling contacts who meet the criteria may mean these individuals will suddenly start receiving emails for content they may have downloaded quite some time ago. 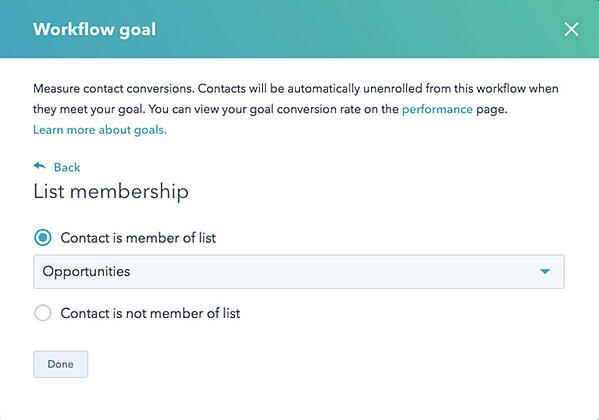 You might prefer to not enroll these contacts and instead nurture these older leads via a separate workflow designed specifically for reengagement. On the other hand, if the offer is new, you’ll probably want to enroll contacts who meet the criteria, to make sure you’re not accidentally leaving anyone out who recently downloaded the offer. We usually add a delay of three to five business days after the lead downloads the first offer. This gives the lead some time to read and digest your original offer, but it’s recent enough that you’re still top of mind. Create an email with a message along the lines of “Thanks for downloading [TOFU CONTENT TITLE]. We hope you found it helpful! As you learn more about this challenge, you may find [MOFU CONTENT TITLE] helpful as well.” Include a call-to-action and link to the MOFU offer landing page. Next, let's tackle the middle-of-funnel offers, or MOFU offers. For this workflow, the lead has already engaged with a MOFU offer. Now, we want to guide the lead to a related bottom-of-the-funnel (BOFU) offer. Any lead who downloads a middle-of-the-funnel offer directly. For the first group, if a lead downloaded a top-of-the-funnel offer but is not yet ready to buy, we want to continue to nurture this lead. But we also want to nurture leads who jump right into the middle of our funnel. Perhaps they’re already educated about their challenge or they’ve read some top-of-the-funnel content somewhere else. Regardless, once they come to us, we want to make sure we’re nurturing the lead appropriately. Like with Workflow #1, we usually add a delay of three to five business days after the lead downloads the previous offer. This email will be similar to that in Workflow #1. You’ll want to thank the lead for reading the middle-of-funnel offer and suggest the bottom-of-funnel offer as a next step. Now we're ready for our final workflow for leads who download bottom-of-funnel offers, or BOFU offers. Once a lead has downloaded a BOFU offer, you’re ready to push a little harder for the lead to make the purchase. Similar to Workflow #2, we want Workflow #3 to trigger either when a lead completes Workflow #2 without reaching the goal or when a lead directly downloads the bottom-of-the-funnel offer. We typically add a three- to five-day delay to keep our cadence consistent without being overwhelming. However, depending on the length of your sales cycle, you may want to space out this final lead nurturing emails a bit further. Just be careful not to space out your emails too much. Otherwise, prospects will forget about you (which is never a good thing). Here, things get a little different. Because a bottom-of-the-funnel lead is a much warmer lead, it’s time to ask for the sale. We like to start with an initial email that directs the lead to request a consultation with a sales rep. After a delay of a few days, we might send a second email with the same request, worded a little differently. By this time, a lead that started at the top of the funnel will have received four lead nurturing emails and been presented with three different content offers. If the lead still isn’t ready to purchase, we don’t want to keep bothering the lead. But we also don’t want to let the lead completely drop off the face of the earth, either. In this case, we’ll send the lead a final breakup email. The email will remind the lead of the great content offers the lead has seen but will also acknowledge that perhaps the timing isn’t right for the lead to take that final step and make the purchase. Instead, the email will suggest the lead subscribe to the blog. Or, if the lead is already subscribed, the email will remind the lead of all the great content the blog covers and that gets sent to the lead automatically. It’s a final “Hail Mary” pass that lets the lead know we’re ready to engage with them whenever they’re ready to move forward. There you have it. 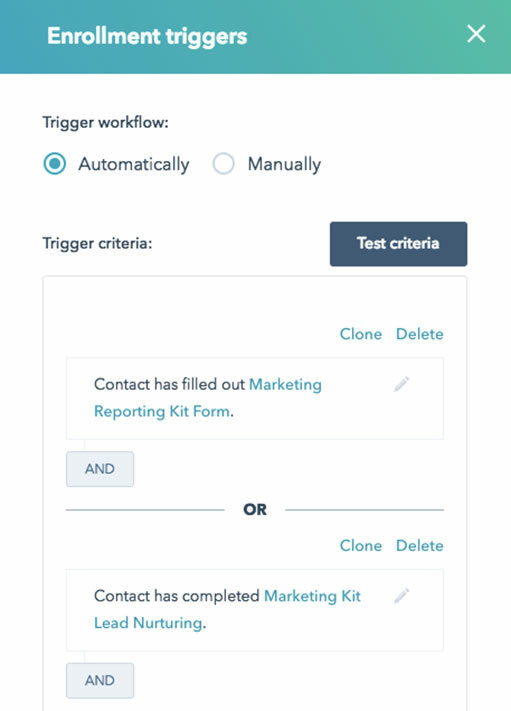 A five-step guide for using HubSpot workflows to launch a lead nurture strategy that will move your leads through the buyer’s journey and hopefully turn them into paying customers. Although creating strategic workflows can feel like a challenge at first, just remember that the goal of marketing automation is to nurture your leads and make your life easier in the process. Think about the next logical step for your lead to move them down the funnel, and send them to that offer. Try not to over-complicate things at first, but as you get more comfortable, don’t be afraid to experiment. Trust us, once you get comfortable with HubSpot’s workflows tool, you’ll find that the possibilities are endless when it comes to ways to nurture your leads. Now that you have your workflows set up, you’ll want to report on how well your offers are performing. Download our Marketing Report Templates and get free, ready-to-use templates that’ll help you track the ROI of your inbound marketing efforts. What Is GDPR and Should My Inbound Marketing Be GDPR Compliant?